The lives of millions will be changed after it breaks, and yet so few people understand it, or even realize it runs through their backyard. 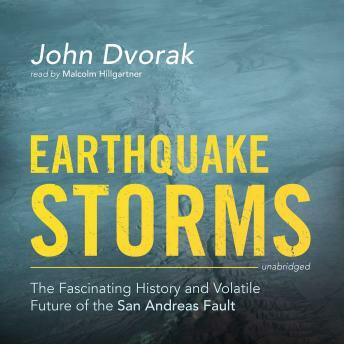 Dvorak reveals the San Andreas Fault’s fascinating history—and its volatile future. It is a prominent geological feature that is almost impossible to see unless you know where to look. Hundreds of thousands of people drive across it every day. The San Andreas Fault is everywhere—and primed for a colossal quake. For decades scientists have warned that such a sudden shifting of the earth’s crust is inevitable. In fact, it is a geologic necessity. The San Andreas Fault runs almost the entire length of California, from the redwood forest to the east edge of the Salton Sea. Along the way, it passes through two of the largest urban areas of the country—San Francisco and Los Angeles. Dozens of major highways and interstates cross it. Scores of housing developments have been planted over it. The words San Andreas are so familiar today that they have become synonymous with earthquake. Yet few people understand the San Andreas or the network of subsidiary faults it has spawned. Some run through Hollywood, others through Beverly Hills and Santa Monica. The Hayward Fault slices the football stadium at the University of California in half. Even among scientists, few appreciate that the San Andreas Fault is a transient, evolving system that, as seen today, is younger than the Grand Canyon and key to our understanding of earthquakes worldwide.